A planned vote on the proposal to formally recognize Palestine as a sovereign state at the UN Security Council is to take place before year-end, Palestine’s chief negotiator Saeb Erekat told the media. A draft UNSC resolution recognizing Palestinian statehood has been penned by the Arab League and submitted after the UN General Assembly passed a non-binding resolution calling for the move. The move is opposed by Israel and some of its close allies, including the United States, which has a veto right at the UNSC, giving it the power to block any draft resolution there. "Our expectation is that the United States will stand by its position for the past 47 years that a solution to the conflict will be achieved through negotiations, and I do not see a reason for this policy to change,"Netanyahu told reporters after a meeting with US Secretary of State John Kerry last week. The progress towards Palestinian recognition at the UN coincides with Palestine achieving the same goal in the EU. 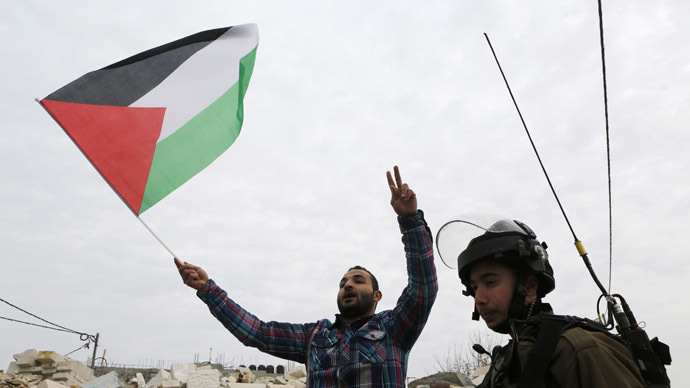 Sweden became the first Western EU member to recognize Palestinian statehood in October, while motions for the same had been voted for by the parliaments of Spain, Ireland and France. Some Israeli officials, including the prime minister, alleged this is due to looming anti-Semitism in Europe. Formal recognition of Palestine’s statehood would assist its effort to stop Israeli occupation of Palestinian territories. Israel captured large swathes of land in West Bank and East Jerusalem during the 1967 War. The tension between Israel and the Palestinian Authority has escalated recently, as the government of Prime Minister Benjamin Netanyahu adopted stricter policies, including construction of new Jewish settlements in the occupied territories. He also launched a bloody bombing campaign on Gaza in what Israel called a crackdown on the militant movement Hamas, and lately officially declaring Israel a Jewish state.